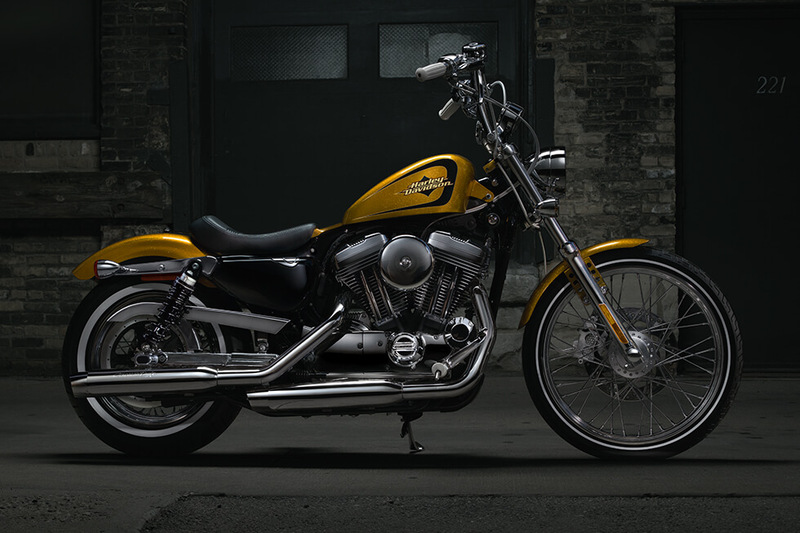 The Harley-Davidson Seventy-Two® is a classic chopper inspired by the 70s. 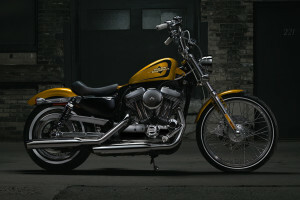 It’s part of the Harley-Davidson Sportster® lineup, and it offers retro chopper style and Harley-Davidson performance. 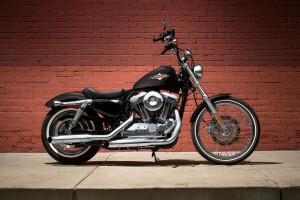 Plus, it’s available right now here at Riverside Harley-Davidson in the Los Angeles and Inland Empire, CA area. Find out more about this vintage inspired ride below! 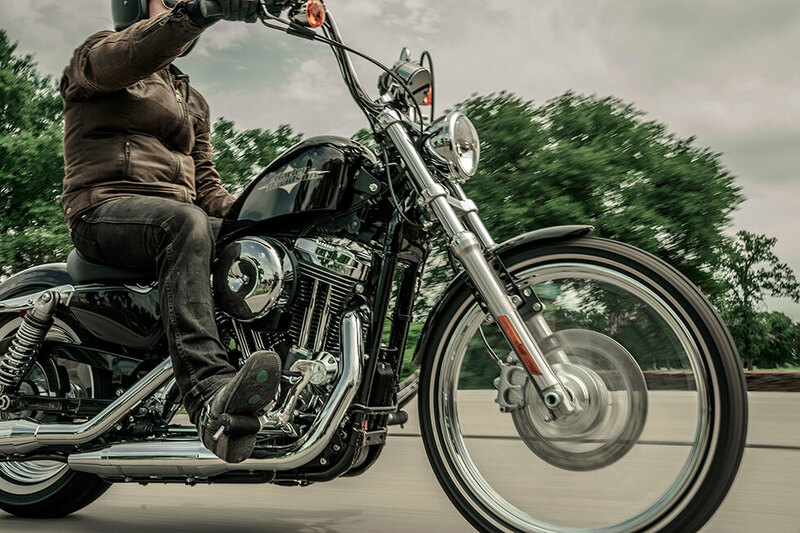 The Harley-Davidson Seventy-Two® comes with the powerful and reliable Evolution® V-Twin. This air-cooled, rubber-mounted 1200cc engine offers ample power and performance. It also offers modern engine technologies including lightweight aluminum heads and cylinders, and electronic fuel injection. 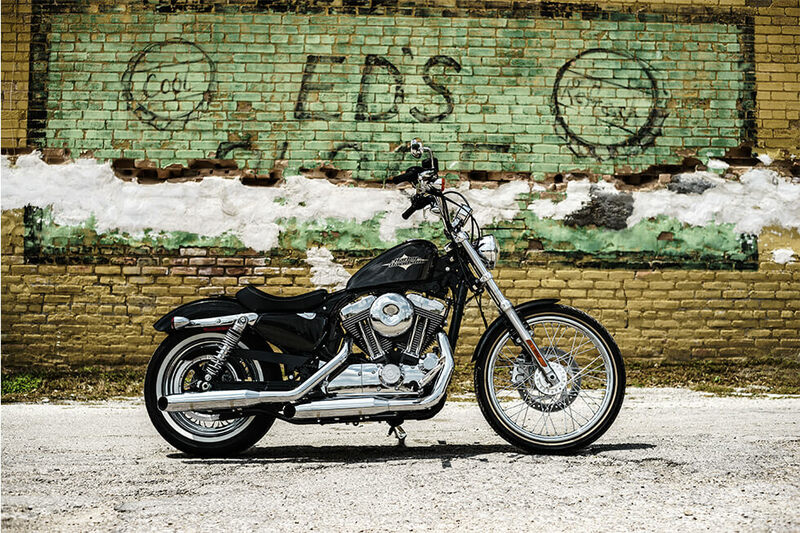 Pure Styling – The 1200cc Evolution® engine is a gem cast in pure metal, and it displays all of the authentic Harley-Davidson details you crave. 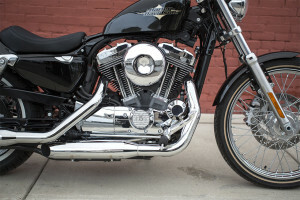 Loaded with vintage attitude from the round, old school air cleaner to the black powder-coated cylinders, cylinder heads, and chrome rockers, this engine holds true to its roots. Heritage – The Evolution® engine, which some like to call the Blockhead, is a direct descendent of the iconic Shovelhead and Ironhead engines of the past. 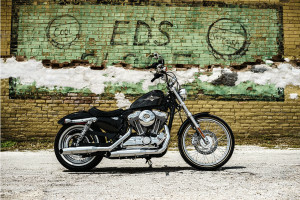 First turned loose in 1984, this innovative and powerful engine has proven itself to be a durable and reliable mainstay of the Sportster® lineup. Innovation – This innovative, air-cooled engine is loaded with the latest in advanced motor tech, which not only makes it more reliable, but also cuts down on the amount of routine maintenance required. 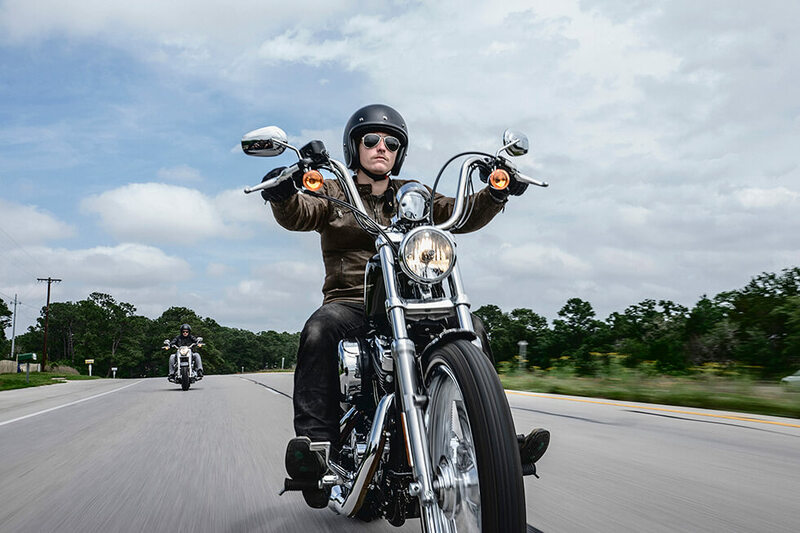 Featuring electronic fuel injection, the 1200cc Evolution® is rubber-mounted, so you can count on it to reduce vibrations, giving you a smooth, even ride. The Harley-Davidson Seventy-Two® with its raked out fork, big front wheel, and mini ape-hanger bars, could have been ridden straight out of the 70s. 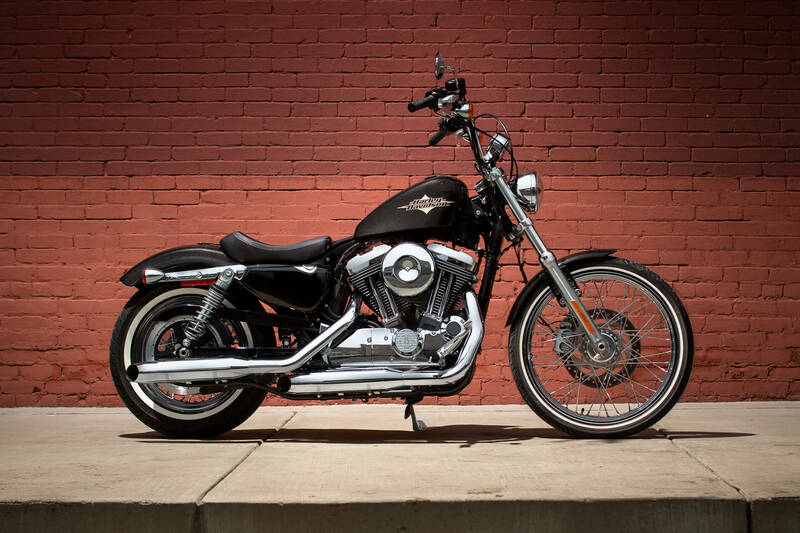 It’s an eye-catching throwback chopper that’s sure to turn heads anywhere you ride. 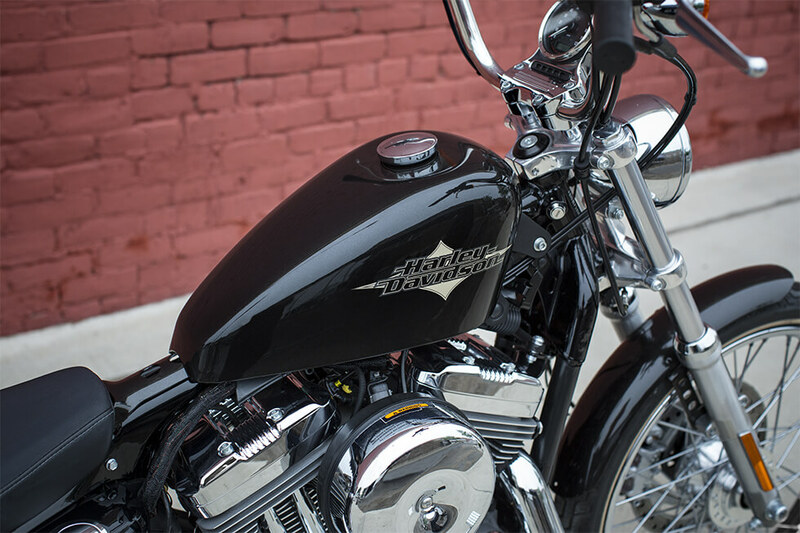 Premium Paint – Hard Candy Custom™ paint provides a bold metal flake finish that harkens back to the outlaw style of custom bikes in the 70s. Colors available for the Seventy-Two® include Hard Candy Custom™ Gold Flake and Hard Candy Custom™ Black Gold Flake. 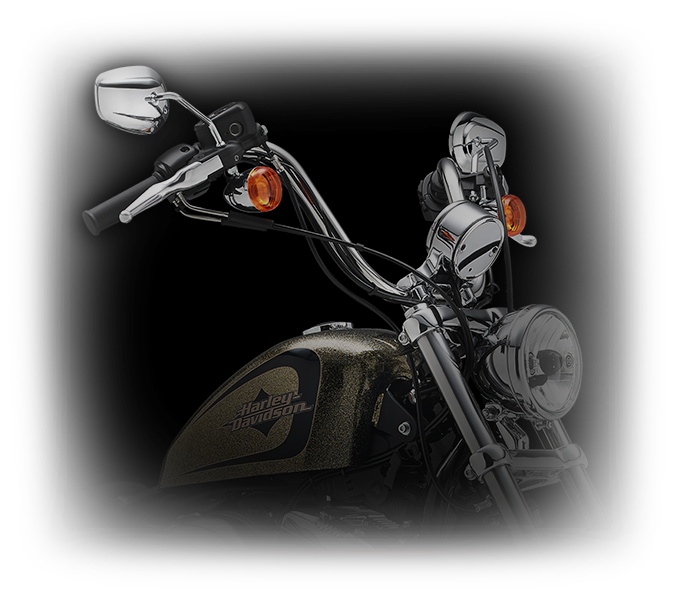 Mini Ape-Hanger Handlebar – Inspired by the classic choppers of yore, the stainless steel mini ape-hanger handlebar provides that timeless vintage look. 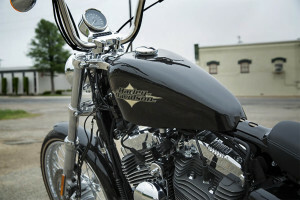 Fuel Tank – The Seventy-Two® sports a classic peanut fuel tank, which was first introduced back in 1948. With its low profile, this 2.1 gallon tank has a sleek, tapered design that really showcases the engine. Traditional Air Cleaner Cover – The 8-inch, retro styled air cleaner cover is at once a throwback to the days of old iron muscle, but with a bold contemporary look. 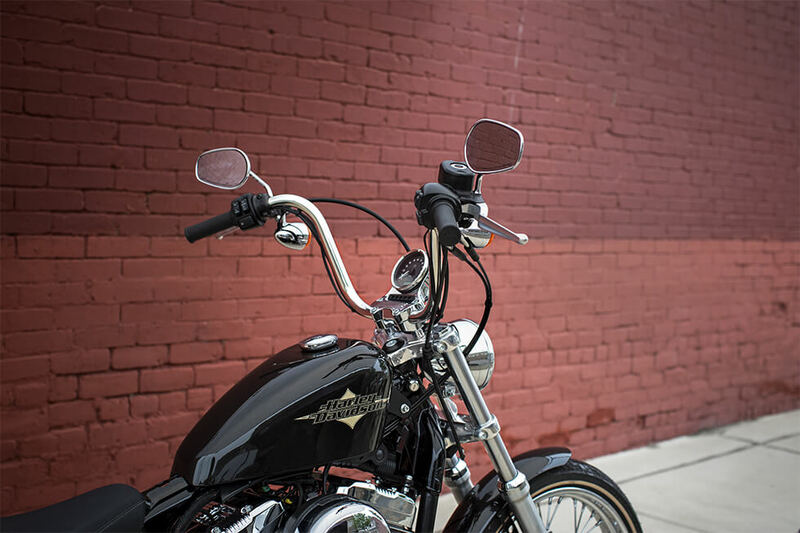 Street legal and in gleaming mirror chrome, this air cleaner cover helps provide that classic chopper attitude. Wheels and Tires – An old school low-ride style is enhanced by lace-spoked wheels wrapped in whitewall tires. The front wheel measures in at a massive 21-inches. Rear Styling – The chrome bullet taillights may look retro, but they benefit from new technology, combining stop beams, running lights, and turn signals in each lamp. The chopped rear fender and side-mounted plate put just the right finishing touches on the styling, keeping it raw, authentic, and modern. While the Seventy-Two® is most definitely a retro-inspired bike, it comes with some of the most advanced technology available. It’s the smartly updated version of a classic custom chopper. 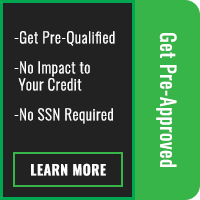 Integrated Electrical System – All of those bulky wiring harnesses, fuses, relays, and switches are hidden by the integrated electrical system, giving the Seventy-Two® a tough, clean, lean, and mean look. Foundation Brake System – The new Foundation Brake System features huge 300mm rotors, stylized calipers with 34mm pistons, an aluminum rear master cylinder with reservoir, an all-aluminum front master cylinder designed to provide improved efficiency and reduced friction, and braided stainless steel lines. Ergonomic Hand Controls – Comfort and convenience are added with the new ergonomic hand controls. They’ve been intuitively designed and incorporate self-canceling turn signals, trip and “start” switches, and easy-to-reach brake levers to allow you to keep your eyes on the road where they belong. 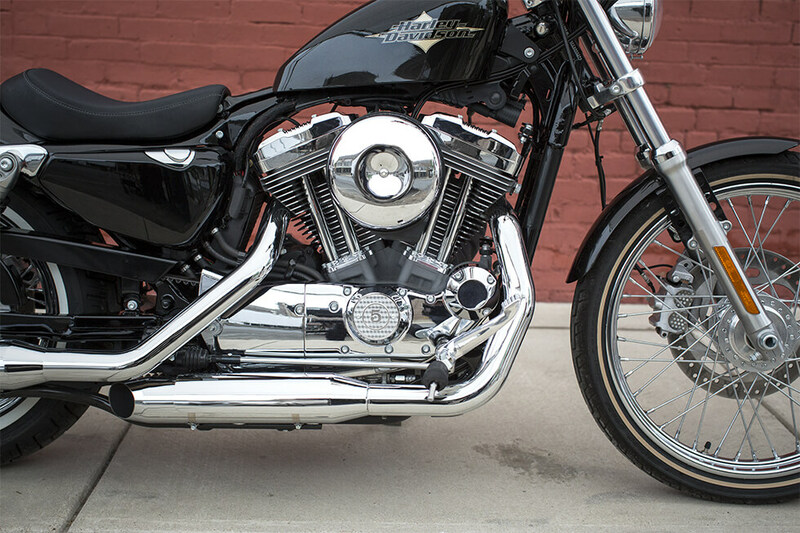 Exhaust System – The Seventy-Two® comes with a closed loop exhaust system that features big sturdy mufflers with exhaust shields. Designed to deliver raw power, the system also includes a catalyst with mini heated oxygen sensors to reduce emissions and improve ride quality. 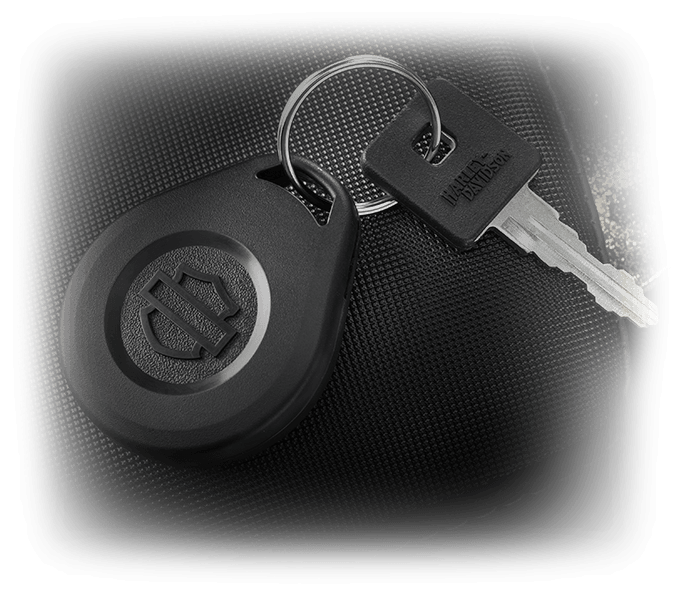 Smart Options – Two important options you may wish to consider are anti-lock brakes for all condition stopping power, as well as the H-D® Smart Security System, which activates via a wireless key fob when you leave the bike. 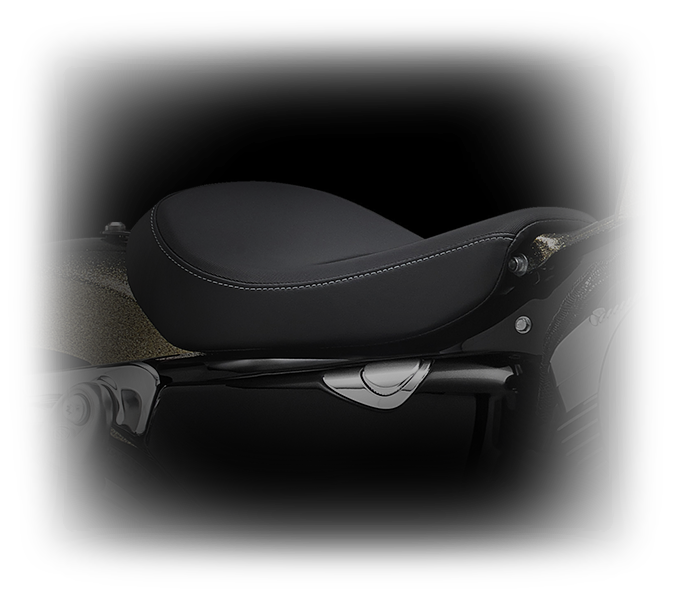 Dialed in to provide comfort and control, the Seventy-Two® is designed to allow you to stretch out and enjoy the ride. New Suspension – Up front the new suspension system features a big 39mm fork with cartridge damping to smooth out your ride. In the rear there’s a new emulsion shock with screw adjuster so you can easily dial in the ride that best suits your style. Forward Mount Controls – You can stretch out in comfort and enjoy the ride with the custom forward-mount controls. New Solo Seat –The new solo seat may be retro-styled but it is crafted with 21st century materials that provide all day comfort without taking anything away from the authentic custom chopper profile.